Frozen shredded coconut is easy to use. Break off a piece and thaw it in microwave, the coconut is as good as fresh. Using young coconut also works. If you have a young coconut that you drink all the juice but don't know what to do with the white coconut meat, you can shred it using a coconut shredder. Boil enough water in a pot to cover the corn. Peel the husks and discard them or save them for containers. I cut the corn in half to fit into my pot. Boil the corn for less than a minute, just to cook the corn without leaching out the sweet juice. Make sure you turn the each side to submerge it under water. You can see the cooked kernels with bright yellow as opposed to dull yellow. Drain the water and let the corn cool down. If you use the frozen shredded coconut, thaw it in the microwave for 20 seconds or so. Fluff the shredded coconut. 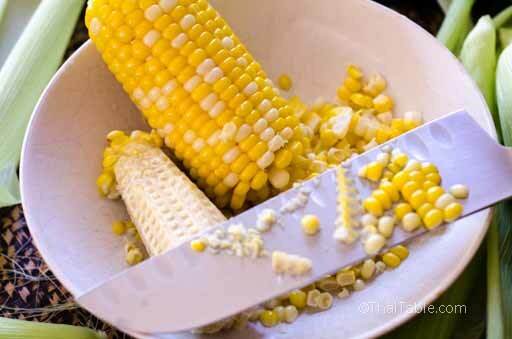 When the corn is cooled enough to handle, slice the corn from end to end. You may get about 1 cup of corn. 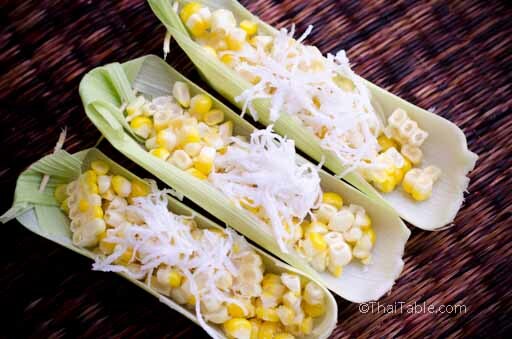 Plate the corn in a container or plate. We use corn husks here as a container. 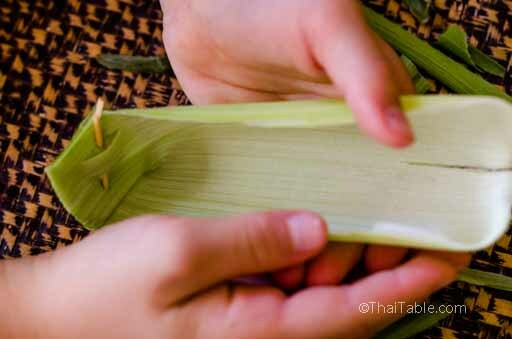 Fold and tuck the ends, secure it with half of a toothpick. 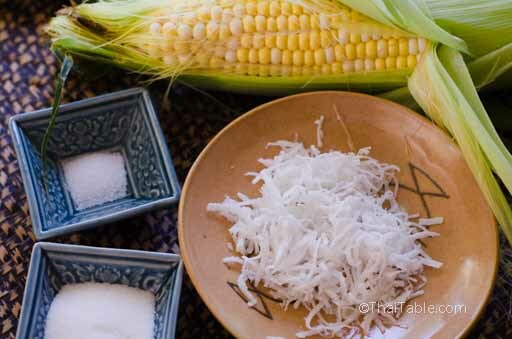 Spoon the corn into the husk, sprinkle about 2 teaspoon of shredded coconut, sprinkle ½ teaspoon of sugar and a pinch of salt on top of the coconut. Serve at room temperature and enjoy.